Here I was thinking that I had tiny wrists and forearms. Ahh to have the movie star life - workout, tan and travel. They should start marketing that super soldier serum. hopefully his wrists wont break under the enormous weight of his python's. BoloMusashi wrote: Here I was thinking that I had tiny wrists and forearms. Ahh to have the movie star life - workout, tan and travel. Though the pic could just be overexposed. I was uncertain when they cast Chris Evans as Cap due to his build and the whole Johnny Storm issue. I saw the pictures of the suit and I thought ok this is a bit better, then they released the pics of the stunt double and I thought this now does not look good. Decent quality version of the new full costume reveal photo! Personally, I really like it! Wow. He certainly fills out the outfit! These are both WWII costumes aren't they? I'm sure we will see the modern interpretations come June. Artistix wrote: Wow. He certainly fills out the outfit! Sweet Jesus! I just noticed. diabolikprime wrote: These are both WWII costumes aren't they? I'm sure we will see the modern interpretations come June. 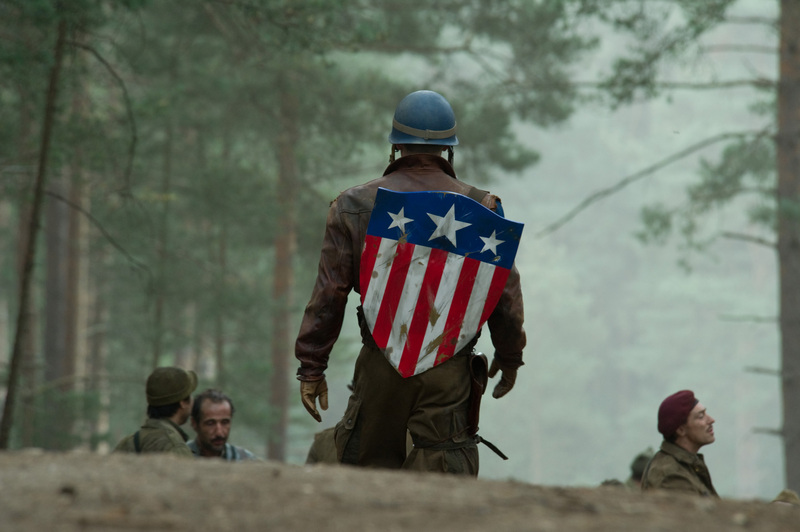 You wont see Cap in the modern era until The Avengers. But you can bet that Cap's new look will be the key promotional "reveal" leading upto that film. 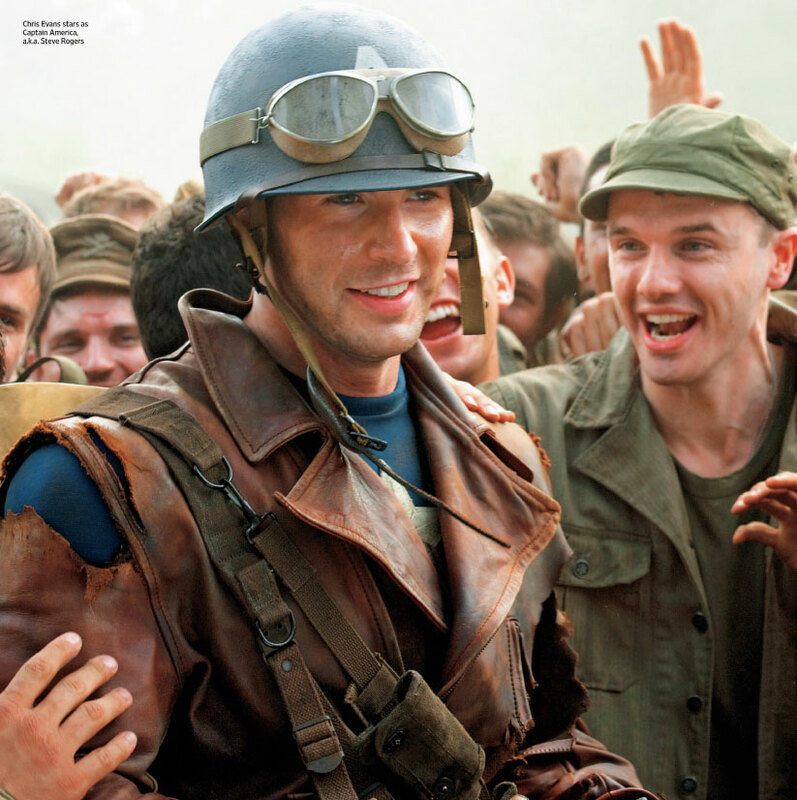 DroothR wrote: You wont see Cap in the modern era until The Avengers. Actually, the movie is bookended with the modern era and the WW2 era is the filling. However we may get a tease of the modern suit at the end of Cap, and see him wearing it in The Avengers. Very possible, but I'd still bet on a modern suit being kept for The Avengers. It just makes good marketing sense. I heard/read something along those lines as well - maybe it was on /Film or ComingSoon.net. I also remember some mention of a corny USO uniform. I'm sure minor modifications will be made to the suit between the last scene of CtFA and the first part of the Avengers movie - years spent as an ice cube will cause some damage to the threads. BoloMusashi wrote: I heard/read something along those lines as well - maybe it was on /Film or ComingSoon.net. I also remember some mention of a corny USO uniform. I'm sure minor modifications will be made to the suit between the last scene of CtFA and the first part of the Avengers movie - years spent as an ice cube will cause some damage to the threads. Very cool pic! Thanks for the links. Loving this poster !! cannot wait until we get to see the first teaser on or around Monday! !